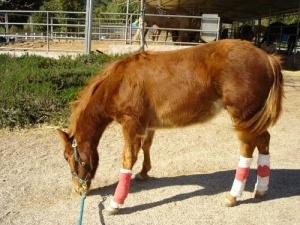 One of the very first rescues taken into the Sanctuary when he was only 7 months old, Carter, named for his surgeon, and also known as "Lil Man," needed surgery on all 4 legs because of epiphysitis (crooked legs, whether knock-knees or bowlegs - in Carter's case he had both), caused by abnormalities in the growth plates. We got him much later than hoped and did so only when the breeder realized he wasn't going to get better without care and was going to shoot him because he could not sell him. Although knowing it might be too late for Carter, we took him anyway so he at least would not get shot. Even though we were told he would not reach his full size and would not be a performance horse, the surgeon said that he could help him and we need not euthanize him. 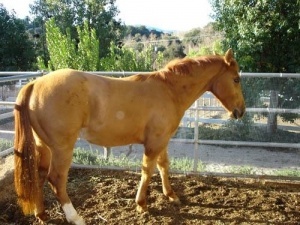 HCW's co-founder in Thousand Oaks located a donor to pay for the surgery and now "Lil Man" is a feisty sorrel gelding with a regular sized body and Toulouse-Lautrec style short legs, but he's happy, healthy and comfortable.